At UFC on ESPN +1 we saw TJ Dillashaw became the first UFC champion in recent years to fail in a bid to become double champion. The current bantamweight champ was violently stopped by the flyweight champion, Henry Cejudo in under a minute. And as the dust settles on the main event of the UFC's inaugural offering on an ESPN platform, the question now shifts to what’s next for each of them. 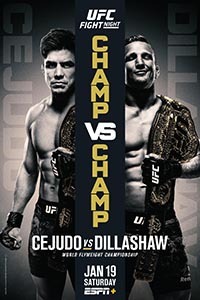 The idea of a rematch at 135 pounds has been posed; however, the result of Cejudo-Dillashaw has created the perfect opportunity for the UFC to squash the trend of “superfights” and "champ-champ" statuses. Such a step would be something that many top contenders would greatly appreciate. Cejudo’s first-round knockout put a stop to the notion that Dillashaw was going to kill off the flyweight division. The weight class that Demetrious Johnson lorded over for more than 1,000 days as champion seemed to be on the chopping block even before “Mighty Mouse” lost the title. But now, Cejudo is a champion with a lot of excitement around him and a lot of momentum behind him, holding a belt in a division full of men that are chomping at the bit for an opportunity to get into the Octagon with him. Joseph Benavidez, who holds a controversial win over Cejudo, is one such individual. So instead of calling for an immediate rematch with Dillashaw that will take him out of the flyweight division, Cejudo should capitalize on this moment where the spotlight is on the 125-pounders. In fact, this is an opportunity for both divisions to get restarted, especially with the amount of divisional upheaval we've seen in recent years. Since 2015, when Conor McGregor became the featherweight champion, then immediately started talking about fighting at lightweight, the allure of holding two UFC titles has caught the attention of fighter and fan alike. After McGregor dethroned Eddie Alvarez, Daniel Cormier and Amanda Nunes followed him, stamping their respective places in MMA history. And legacy is important to fighters, but holding two belts simultaneously may often (but not always) put double champions in a position to make more money –- the main objective for prizefighters. But what about the position that it puts contenders in? 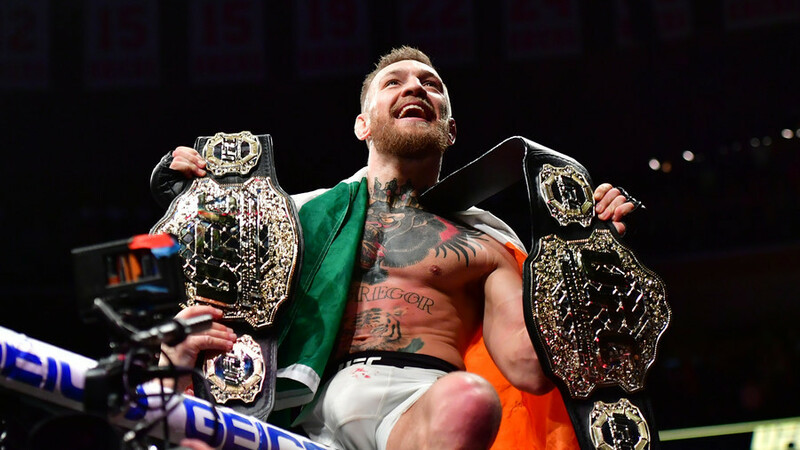 We saw the way featherweight was held up by McGregor’s division-hopping antics. Before Jon Jones returned, there was concern about what would happen with the light heavyweight title if Cormier focused on defending the heavyweight title. At bantamweight, both Rafael Assuncao and Marlon Moraes have legitimate claims to title shots, but because Dillashaw chose to drop to 125 pounds instead of take one of them on, they are facing each other in the main event of UFC on ESPN+ 2 instead. And if a Cejudo-Dillashaw rematch does happen at 135 pounds, it'll be because Cejudo leapfrogged the winner. As more and more champions challenge other champions, contenders are pushed to the wayside. They have to choose between continuing to fight in order to remain active (risking taking a loss or getting injured), and remaining inactive, waiting on the sidelines for the shot they deserve (risking career stagnation and not making any money). And the problem doesn't seem to be slowing down anytime soon. UFC Welterweight Champion Tyron Woodley has started making noise about challenging for the middleweight title if he defeats Kamaru Usman and Colby Covington. 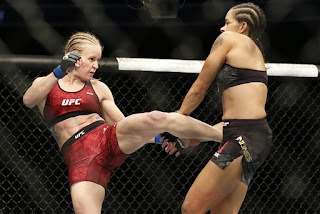 Valentina Shevchenko finally obtained gold when she captured the UFC Women’s Flyweight Championship, but there are already rumblings that she may soon go back to bantamweight to fight Nunes for the title for the second time, their third fight overall. That means that a 125-pound division filled with surging contenders will be forced to wait. It's incumbent upon the UFC to put a stop to it. The first UFC show on ESPN+ featured a lot of up and coming talent. The promotion's new partnership with ESPN gives it an opportunity to build up talent in a manner that the FOX platforms couldn't facilitate. However, the key to developing this talent is establishing an end goal for them to fight for; that is the title at the top of whichever division they compete. 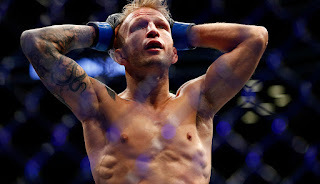 TJ Dillashaw's embarrassing and one-sided loss in his bid to become a double champion should be the wakeup call that the UFC needs to convince its decisionmakers that the practice of a champion chasing another division's belt should come to a halt.